This doggy pad reminds a heck of a lot of the Fish Condo I showed you a while back. Apparently, the market for modern pet homes is booming! That is so cute! I've been hearing the cutest pets' names today, and Monkey is a really good one! omg. so adorable. i want one for my kitty!!! I have one and let me tell you. she is beautiful. 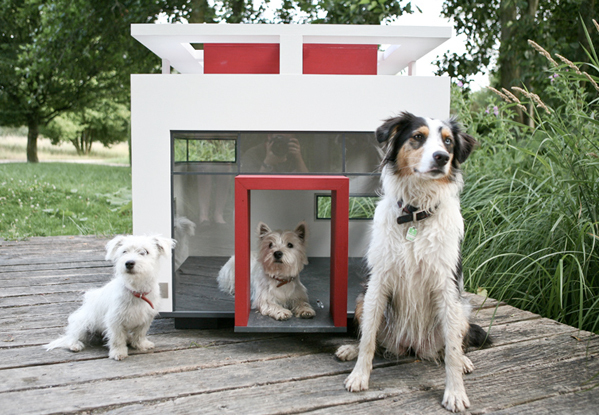 A modern dog house...now I've seen it all! I really want another dog myself. But unfortunately now's not the time. I so miss having a dog around, though. Thanks for the mention, Marissa. I appreciate it! Amazing, you have to get a dog solely to justify buying this! I think bama needs one of those for real!! Oh I do that too, realize I don't know some things about people whose blogs i read all the time! Yes, I'm american - I moved to Switzerland a little over a year ago because Mark, my husband, found a job here! this is just drop-dead adorable! i buy way too many cat houses for ernst and he never seems to enjoy them as much as i do. i recently saw a cat teepee on modcloth and had to stop myself! Monkey is the perfect name for a dog. Do it!! I can't til we have a house and can get a pimped dog house for our bullmastiff!! Thanks for the link love, doll! That is the most awesome doghouse EVER! This is possibly the CUTEST thing ever! Loooove it! Following your blog now! !